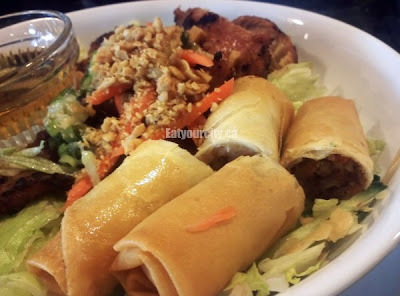 Posted by While driving by one of the newer strip malls that seem to be popping up everywhere in the deep south of Edmonton, we dropped by a new family run Vietnamese restaurant. I love trying out new places and supporting the little guys, so in we went! An open expanse of dining area greets you as you enter along with granite topped tables, sleek seating and really, decor I'd expect at a higher end restaurant... pleasant surprise! Don't get me wrong, this is a restaurant that welcomes and caters to families... there was a few tables with little kiddies having a blast trying to get food all over their table, chairs, faces and sometimes their mouths, with the waitress calmly and patiently serving everyone and cleaning up as she went. 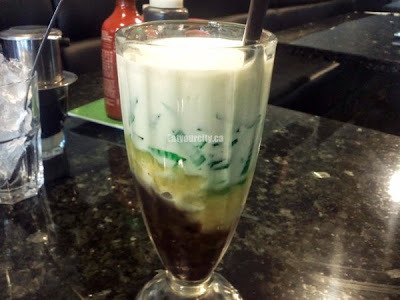 Didn't see jack fruit on the drink menu, so went with a multi bean dessert drink made with coconut milk, red beans, green beans, coconut milk, a small bit of crushed ice and green jelly strips. 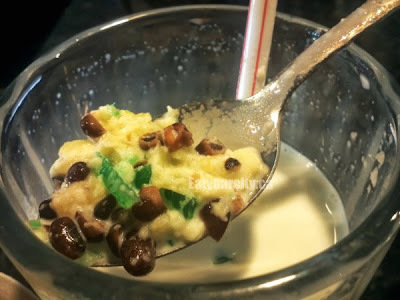 It actually needed a bit more ice to dilute the drink as it was on the sweet side, but tasty and filling. Can't go wrong with drinking a dessert! My boyfriend went with an iced Viet coffee. 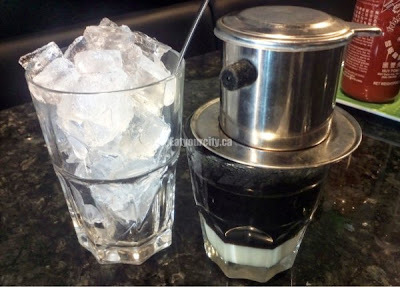 It was on the weak side as whomever made it forgot to tighten the meat screw in the coffee maker (tighter you screw it in, the longer it takes it drip out the coffee and stronger the coffee), so tasted like a simple iced coffee instead of a strong and flavourful cup once we dumped it into the ice with a touch of condensed milk. Though there was pho, dinner entrees, we were craving something grilled, so went with their rice vermicelli bowls. 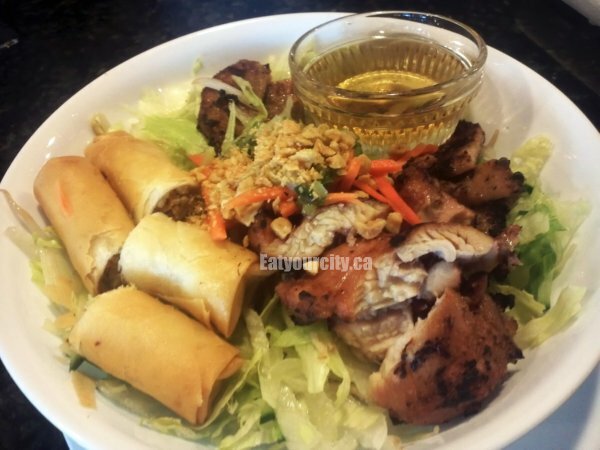 I went with the Spring rolls, grilled pork, grilled chicken vermicelli bowl. The fish sauce needed a bit more acidity and could have used some shredded carrot for a touch of sweetness, but lent just enough flavor to the noodles. The chicken was moist, had nice grill marks and incredible lemongrass flavor throughout. The Grilled pork pounded thin was nicely seasoned but I enjoyed the chicken more. The springrolls were nice and crispy, and reminicent of the homemade ones my Viet friend's moms make. Mmm! And don't be sad to see that the bowl looks small, its actually quite filling! 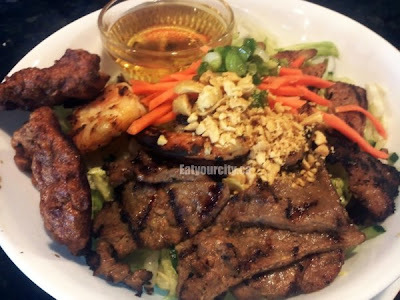 My boyfriend went with the Grilled prawns, pork, beef and meatball vermicelli bowl. 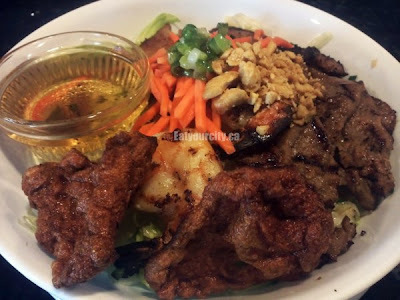 The three medium shrimp was crisp and savoury, the pork was the same in my bowl and the beef quite flavorful if cooked to well done - it was super thin, and is usually cooked to well done at most Viet restaurants. The peanuts, carrots and lettuce added in a nice textural element. Nom! 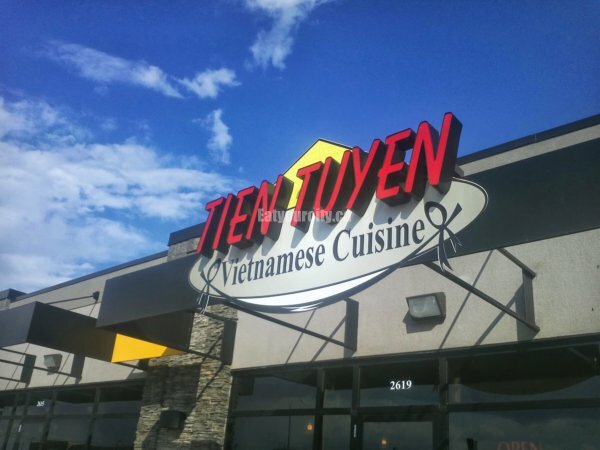 Overall, Tien Tuyen is off to a good start. There's some little things that need ironing out, but glad there's a decent place for Vietnamese fare in the deep south. 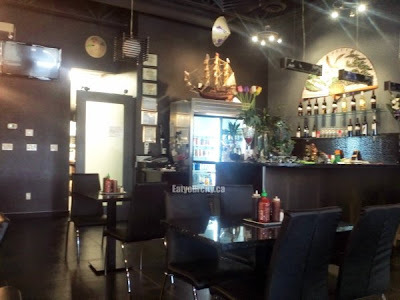 Next time, will have to try their soupy noodles!